When you no longer need a PivotTable, select the entire PivotTable, and press the Delete key to remove it. If you get a "Cannot change this part of a PivotTable report" message, make sure the entire PivotTable is selected. Press Ctrl+A, and press Delete again. Pick a cell anywhere in the PivotTable to show the PivotTable Tools on the ribbon. Click Analyze > Select, and then pick Entire PivotTable. Tip: If your PivotTable is on a separate sheet that has no other data you want to keep, deleting that sheet is a fast way to remove the PivotTable. 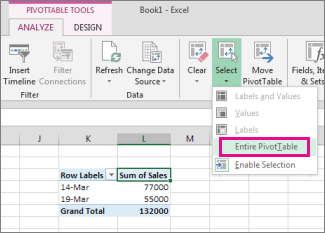 To remove a PivotTable from your workbook in Excel Online, select the entire PivotTable and press Delete. If your PivotTable is on a separate sheet that has no other data you want to keep, right-click the sheet tab and click Delete.